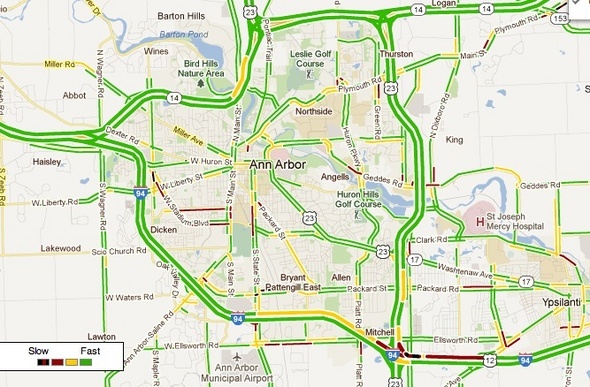 Posted on Thu, Jan 12, 2012 : 7:31 a.m.
A crash is slowing traffic on Interstate 94 near US-23 this morning in Ann Arbor. Police had just arrived at the accident on the westbound ramp from I-94 to northbound US-23 at 8:24 a.m., a dispatcher said. No information was available about the number of vehicles involved or whether traffic was blocked, but a Google traffic map showed a significant slowdown in the area. Two earlier crashes at westbound M-14 and Barton Drive and northbound US-23 and Washtenaw Avenue have been cleared. Thu, Jan 12, 2012 : 2:50 p.m. I can't wait to see how they drive tomorrow morning! People in this area, as educated as they may be, do not understand the meaning of &quot;slow down&quot;! Thank you Candy well said.